Joomla or Drupal or WordPress? 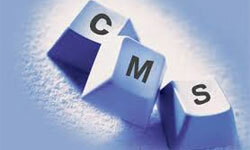 The battle among Content Management Systems (CMS) is getting hotter with each passing day. While Drupal comes across as a very robust, scalable CMS with a very steep learning curve. It would be overkill to use Drupal for simple brohureware kind of sites. Now, we come to WordPress which has evolved from being a free and open source blogging tool to one of the most comprehensive and widely used CMS. It is a runaway success due to its ease of use. So where does Joomla Stand? Joomla fits right in the middle, where it takes some skill to set up Joomla website properly, but can be continually managed by people with less technical expertise. Joomla is a free and open source content management system for publishing and managing content on the World Wide Web and intranets and a model–view–controller (MVC) Web application framework. Joomla has been downloaded more than 35 million times making it second most used CMS after WordPress on the internet. Adding to the impressive stats over 6,000 free and commercial extensions are available from the official Joomla! Extension Directory. The strong points of Joomla are its extensions (Modules and Components).If you need specialized functionality in your site, Joomla is highly extensible and thousands of extensions (mostly free under the GPL license) are available. Just visit Joomla! Extension Directory and in almost all cases you will find the tool you are looking for. You can install a new plugin by merely installing the .zip file through the admin panel. It is cost-effective as you don’t have to hire developers to add functionality to your website. However, a word of caution you are likely to bump into poor modules. It is best to check feedback on module prior to actually installing it. With more than 200,000 community users and contributors, Joomla has vast community support and you can get regular update from the community. You can solve your problems and technical glitches with community help. The community is too large and steady to fade away anytime soon. Joomla is free, open, and available to anyone under the GPL license. You can use its source code as per your requirements; significantly reducing your development cost. I have build sites exclusively in Joomla pretty quickly for my clients. Clients are pleased because they can easily manage their own sites (with minimal training) themselves without huge overhead cost. Joomla is easy to install and set up. You don’t need to worry even if you’re not an advanced user. Many web hosting services offer a single-click install. You can get up your new site up in just a few minutes with minimum clicks. You can easily enter, delete, and/or modify content on websites driven by Joomla. Creating content in WYSIWYG publisher is simple allowing even novice users to combine text, images in an captivating way. Once you’ve created your articles, you can show the articles based on popularity rankings, newsflashes, and much more through a number of pre-installed modules. Joomla is getting stronger by the day. It is evident by the fact that community-efforts for Joomla are speeding up now more than before. Large sites are being launched on Joomla almost regularly. One of the major drawbacks is the considerable expertise and experience level required for customization. However, there is no doubt that Joomla is the most feasible CMS option available which will help your business grow in the virtual world. Hariot Marks is a Professional Joomla Developer associated with VITEB – a web development company in India. She is passionate in helping fellow developers with various open source web development technologies such as Joomla Development, WordPress development, Drupal development and more.